GNP Crescendo Records is proud to announce another volume in its continuing series of expanded Star TrekTM releases. Star Trek: Insurrection was the third of four movies to feature the characters of the 1987–1994 television series Star Trek: The Next Generation, and the fourth Star Trek feature scored by Jerry Goldsmith. Goldsmith had created a template for Trek films with his score for the first picture in the franchise, Robert Wise’s Star Trek: The Motion Picture (1979). His subsequent scores for Star Trek V: The Final Frontier and Star Trek: First Contact (the latter co-composed with his son Joel) built on that foundation while expanding the musical horizons of the Star Trek universe. Goldsmith retained many of the time-honored themes and effects of his previous Trek scores in Insurrection, fostering a sense of familiarity while at the same time giving the film a new identity. Because of the lovely romantic subplot, he wrote a score using, in his own words, “a much more melodic, romantic approach … almost operatic,” balancing the lyricism with several exciting militaristic action cues. This equilibrium, along with Goldsmith’s restraint in reusing his prior themes and his thoughtful approach to the film’s villains, makes Insurrection one of the most cohesive of the Star Trek movie scores. GNP Crescendo’s new Expanded Collector’s Edition of Goldsmith’s complete score includes a half hour more music than the original 1998 CD, plus several alternates—for a total running time of over 79 minutes. 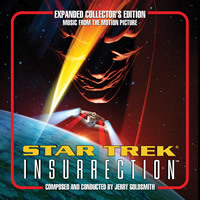 The 16-page booklet, copiously illustrated with film stills, includes authoritative notes by Jeff Bond (author of The Music of Star Trek: Profiles in Style) and Lukas Kendall.A track-by-track analysis of the score and film by John Takis will be available online at gnpcrescendo.com/insurrection.